Today I have a secret recipe for a delicious side dish served at Ruby Tuesday. Red potatoes are boiled and then smashed with just the right blend of seasoning and a nice amount of white Cheddar cheese. These come out rich, creamy and just right! ‘Smash’ potatoes in mixer until smooth. Slowly add warmed milk mixture. Add cheese. 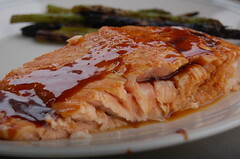 Today’s secret recipe will show you how to prepare a delicious Asian glazed salmon dish that is served at Ruby Tuesday. Fresh salmon filets are baked to perfection in the oven with a sweet Asian inspired glaze. If you’re not a fan of salmon, you can prepare this recipe with a halibut filet instead. Lose The “Mommy Belly” & Bring Back Your Flat Tummy! Mix together the brown sugar, soy sauce, hoisin sauce, ginger, red pepper flakes, garlic powder and fresh lime juice. Heat in a medium saucepan until bubbly. Place salmon fillets in a baking dish. Pour the sauce over the fillets, coating well. Bake for 8-10 minutes. Serve over rice.